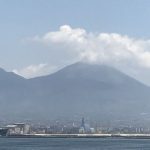 Mount Vesuvius came into view as we passed greenhouses and plots of vegetable growing in the rich volcanic soil. In the warm manner of Italians our guide referred to us as ‘Family’ whenever she wanted our attention. But as is the way of families, discord can occur. Nearing Pompeii Mt Vesuvius erupted inside the coach between two parties, one European the other North American, when one of them made a comment about World War 2 and the other took vehement umbrage. John Cleese would have been delighted at the ongoing veracity of his advice ‘Don’t mention the war’ almost seventy five years after it ended. 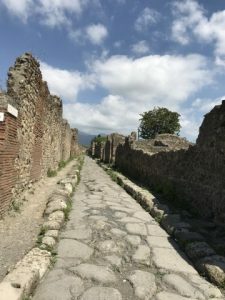 Pompeii had been on my bucket list for years, and the visit didn’t disappoint. It brought alive a lifestyle parts of which I could identify with today. A stylised garden has been recreated around a villa using seeds found on the site and a landscape plan of the time. 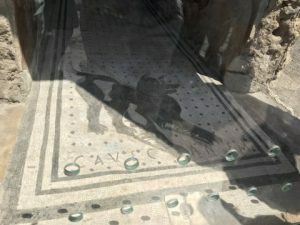 At the tiled entrance to another home the mosaic floor depicts a black dog with the words CAVE CANEM – Beware of the Dog – worked in. Faded frescoes remain on the market walls. 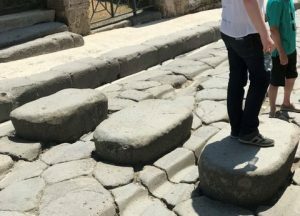 To help pedestrians cross cobbled streets during downpours when water coursed down them large stones were strategically placed so sandals, gowns and togas wouldn’t become saturated. 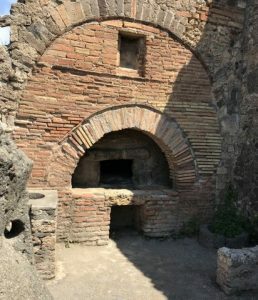 After you bought a loaf of bread from the baker at the brick wall oven you could make your way over to the nearby fast food vendor for a snack of freshly cooked doormouse to ease any hunger pangs on your way home or en route to see the gladiators. 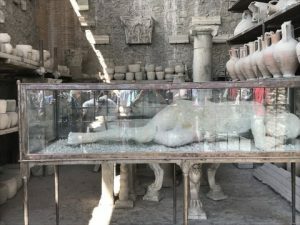 Yes, casts of bodies are displayed in the positions Vesuvius’ pyroclastic cloud overtook them, and the remains of bath houses and temples are there. But for me it was the glimpses of ordinary everyday life I found most illuminating. Wonderful words, Diana. 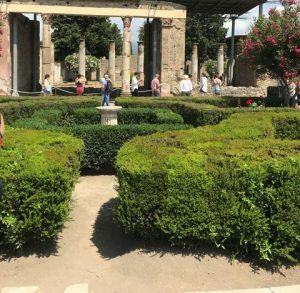 I last visited Pompeii in about 1974 so it’s lovely to see there have been some changes with the growing of a garden and new exhibits.